Oliver Contreras – Pool/Getty ImagesKanye West shows Donald Trump his design for iPlane 1. During the conference, Kanye produced an image of what he called the “iPlane One,” a hydrogen-powered plane that he believes should replace Air Force One. While unlocking his iPhone X, he revealed to the cameras that his passcode is “000000.” He apparently does not use Face ID, Apple’s facial recognition software. Kanye’s Yeezy brand is not affiliated with Apple. 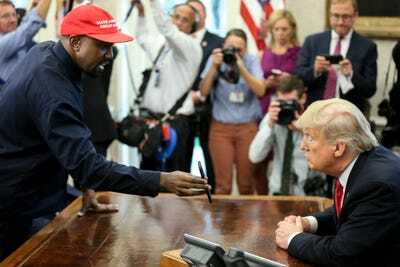 Kanye West has faced criticism in recent weeks for his political commentary, including calling for the abolishment of the 13th Amendment, which ended slavery in the United States.